I need to accurately drill multiple holes in steel pipe (1.25-2" diameter, 65-100 mil wall thickness, about 10ft long). I need to drill a half-dozen or so evenly-spaced aligned pairs of holes all the way through the pipe. So the two holes in each pair need to be diametrically opposite. And the pairs need to be radially-aligned - I'm not sure how best to describe this: maybe, if a line is drawn through each pair of holes, those lines should all be parallel (to each other). Is it possible to do this with reasonable accuracy using home tools, or is a machine shop necessary (e.g. a milling machine) ? How ? P.S. For background: I want to extend the height of a wood railing (it consists of multiple 2x2 balusters with a 2x6 board at the top). I plan to do this by screwing 3/8 x 10" hanger bolts into the top of the 2x6. Then attach the steel pipe to the machine-threaded top of the hanger bolts, with acorn nuts at the top and hex nuts underneath the steel pipe. This is my solution to: extend height of wooden railing. Once the pipe is drilled, I can then use it as a jig for drilling the pilot holes in top of the 2x6 (for the tapered-thread end of the hanger bolts). Perhaps I should consider wooden dowel instead of steel pipe; easier to drill, and cheaper (when I screw up). Yea, I think you'll at least need a drill press. But it really depends on exactly how accurate you need it. clamp a straight piece of lumber to a flat table. Should be at least as long as the span between the furthest holes. Lumber must be <= half the outside diameter of the pipe. Close to half the diameter is ideal. Get a pipe jig you can clamp to your drill press table. Center it under the bit by lowering the chuck & bit down into the jig as you bolt it down. Make a reference mark on the edge of the where it contacts the pipe. Lay the pipe in the jig, adjust the the proper horizontal position, and align the line on the pipe with the mark on the jig. You could do this with the jig and a hand drill. The problems are getting the center of the pipe for the initial hole, and then keeping the drill straight enough when you punch through the other side. It depends on how accurate you need it. Looks like this project has two main issues - getting all the through-holes in the same plane on the pipe, and making a straight hole all the way through a pipe. To draw a straight line on the pipe, you can set the 2" pipe on the flat ground (like the floor of a garage) and place a common (straight) 1x4 board next to it. Run a marker along the corner formed by the board touching the pipe and you'll have a straight line. For drilling the straight holes, you can either buy a drill press (random example) or you can make a jig. The drill press is pretty self explanatory, so here's an idea for a jig. Now, with my amazing artwork out of the way.... You make this structure with some 2x4 lumber and use a steel plate (thin is fine) on the top of the "top plate" and "bottom plate". The total hight of the jig will be about 11". The square at the bottom should be just big enough for the pipe to fit in to keep it centered. Get a 12" long drill bit and drill through the jig as straight as possible measuring as much as you can. This pilot hole will make or break your jig. The steel sheets/plates will help keep the bit centered over the long run but are optional if you don't have many holes to drill (the wood of the jig will waller out after repeated use). If you can get a perfectly straight hole, you should be good to go! insert the pipe and get to drilling. Not the answer you're looking for? Browse other questions tagged pipe drill or ask your own question. How do I drill through steel? 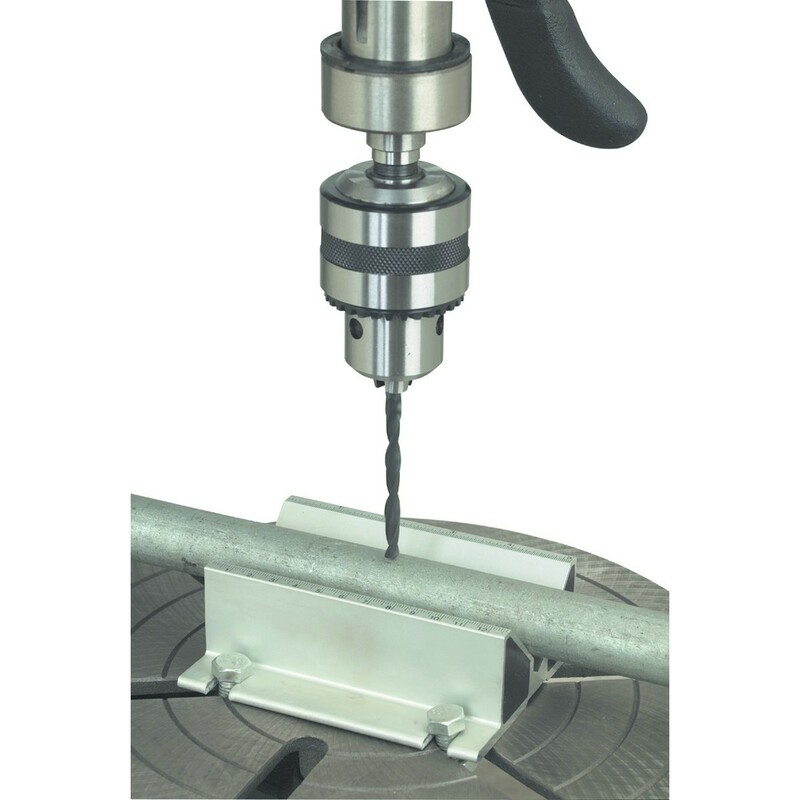 How to drill a hole safely? What jig or template can I use to be able to drill in place through horizontal fence boards to be dead on holes in a steel post?